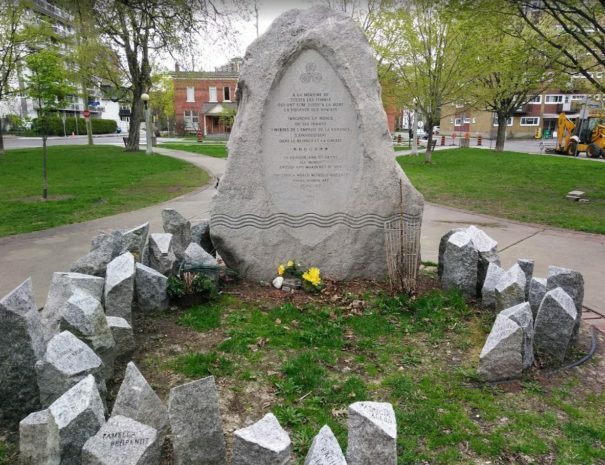 Unsettling Elgin Street: Monuments, Memory and national narratives. Elgin Street - Ottawa's Champs-Élysées? During his tenure as Prime Minister, Mackenzie King imagined Ottawa’s Elgin Street as the Canadian Champs-Élysées. He insisted on placing the National War Memorial at Elgin Street’s northern apex, to create a sort of Canadian Arc de Triomphe. 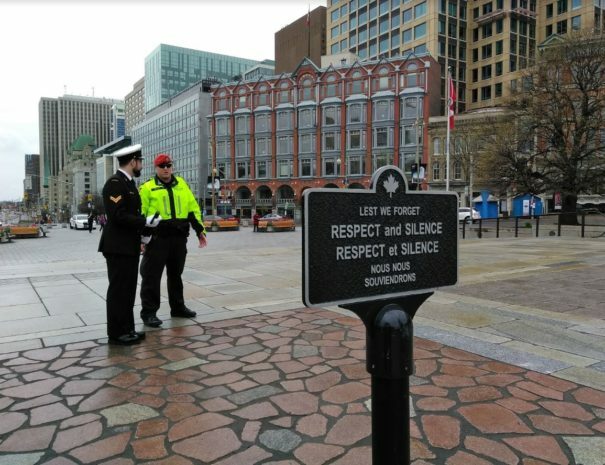 Since the unveiling of the National War Memorial in 1939, Elgin Street has become a street where visitors can walk through dominant narratives of the nation; however, the street and its monuments also allow for the undoing of these same narratives. 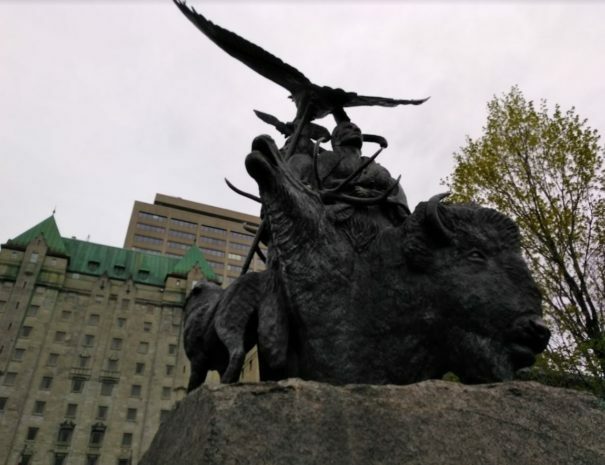 In this walk and talk, beginning at the National War Memorial we will explore how monuments along Elgin Street allow for the generation of multiple sets of memories, nostalgia, and challenges to nationalist narratives. We will visit various monuments along Elgin Street including the Oscar Peterson statue, the monuments in Confederation Park, the Canadian Tribute to Human Rights, and Enclave: The Women’s Monument. Excited we exist? 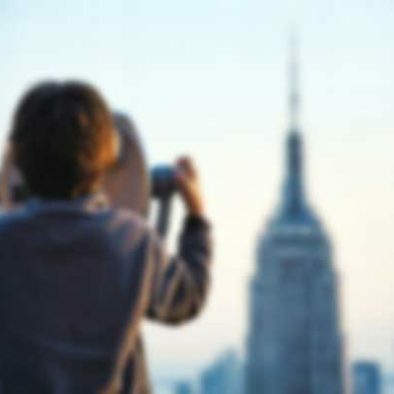 Join one of our tours today! Don't see a price that works for you? Send us an note and we'll see what we can do. Minimum booking: party of 3 people. Happens if you request. Minimum booking: 1 person (or more). Happens if you request. 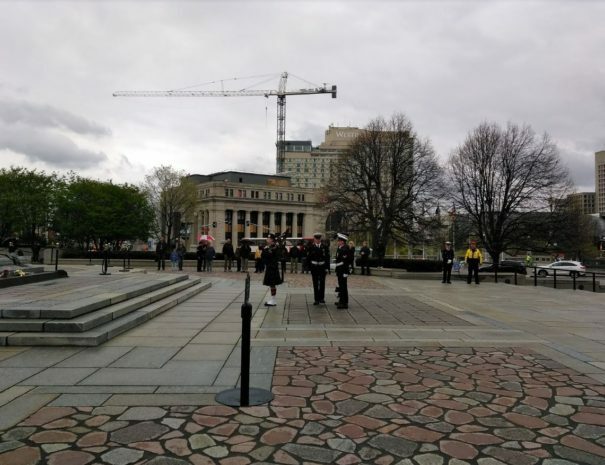 We will talk about the historical and present uses of Confederation Square and the long, dynamic life of the National War Memorial. 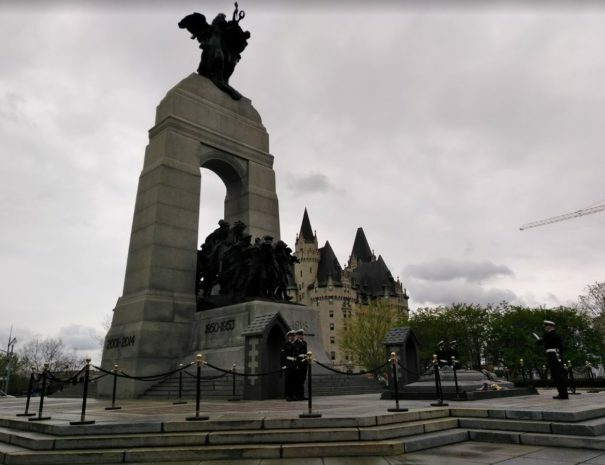 We will visit the Canadian Tribute to Human Rights and discuss the many varied uses of this site, and the relationship between the National War Memorial and the Canadian Tribute to Human Rights. This tour ends in Minto Park at the monument that commemorates and mourns violence against women. Tonya Davidson is a sociologist who has spent many years studying the social lives of Ottawa’s statues. She has published in the academic journals: Space and Culture, Topia: Canadian Journal of Cultural Studies, the Public Historian, and the Journal of Canadian Studies. Tonya has also written for various magazines including Briarpatch, Herizons, THIS, and Canadian Dimension. She teaches sociology at Carleton University. "My in-laws, husband, and I did the tour Nostalgia: Unsettling Elgin Street, which covered the contested memorial landscapes of Elgin Street and how they interact with the dominant Canadian narratives. What we learned is particularly relevant given Canada's self-congratulatory refrain about multiculturalism--our tour guide, Tonya, asked us to think about who is represented in this streetscape...where are the indigenous folks? Black Canadians? Women? Immigrants? Very thought-provoking and our tour guide was a fount of knowledge." “Fantastic educational tour! I lead an annual group of undergraduate students from the University of Maine on a field trip to Ottawa, Ontario. 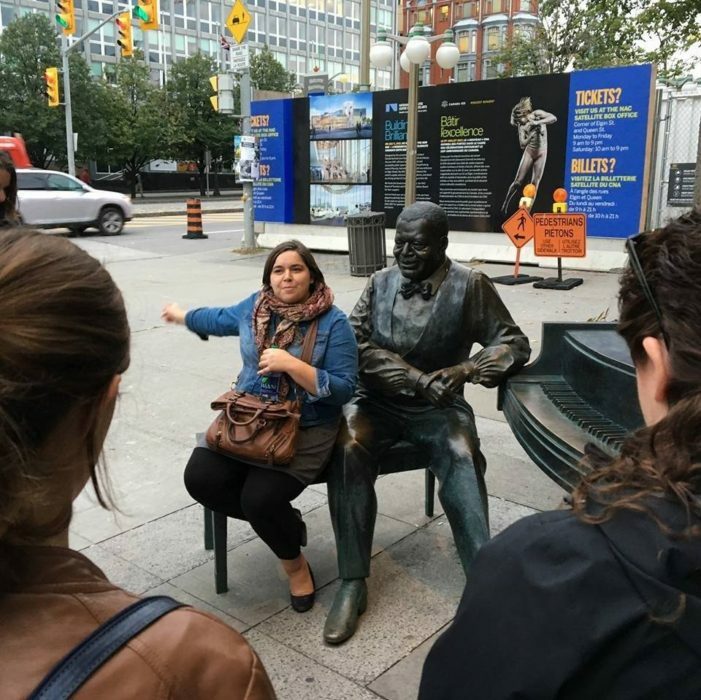 This year, we decided to try something a little different - the Nostalgia walking tour offered by Dr. Tonya Davidson through Ottawa (De)tours. The tour was fantastic. It was informative, educational, and fascinating, but it was also fun and very entertaining. My students loved the whole experience, and several of them thanked me for setting up the tour with Dr. Davidson. Highly recommended." 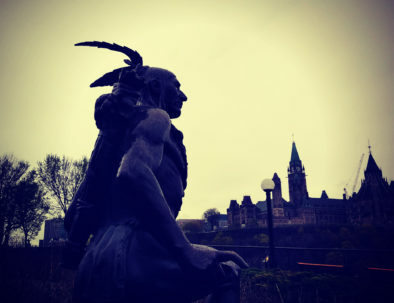 Explore how Confederation and colonialism have shaped Ottawa's built environment. 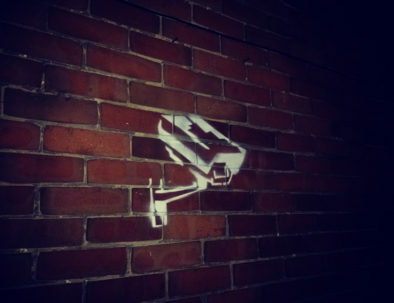 Do you feel watched? Join us as we examine privacy, anonymity and data mining in 21st century Canada. 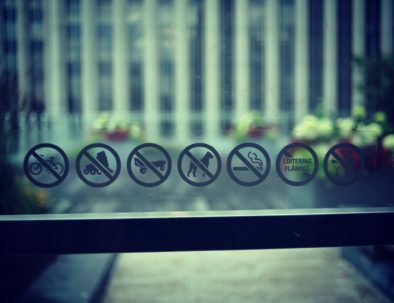 Explore a range of ‘pseudo-public spaces’ and experience how they can make us feel welcome or uncomfortable.